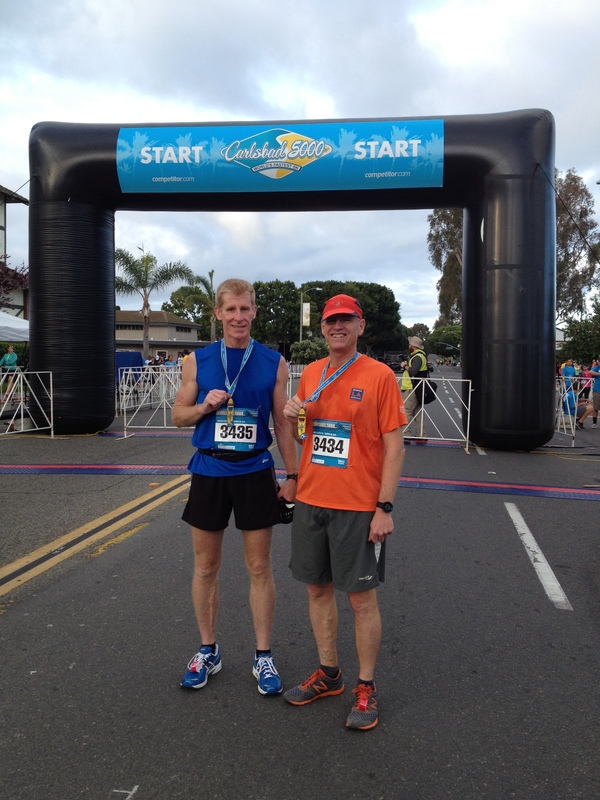 Today Clay and I ran the Carlsbad 5000. The Carlsbad 5000 is a unique fun event. It is a simple 5k. The course starts on a side street, makes a left on Pacific Coast Highway (or whatever it is called in Carlsbad) It rolls along for a mile and a quarter than does a uturn and goes back on the other side of the road. It goes past the street it started on makes a u turn and then comes back. It finishes making a left on the block next to where it started. It is a rolling course, gradual ups and gradual downs. It finishes with a nice downhill! So, it is not a net downhill course. It is not even a pancake flat course. It has two u turns. This may not be a recipe for a super speedy course, yet it is billed as the fastest 5k in the USA. It is….. not because of the characteristics of the course but because of the people who come to run it. The race has been ongoing since 1986. Steve Scott won it the first 3 years and set world and american records in 86 and 88. Since then it has attracted some of the best of the best, the fastest of the fastest. It is a 5K mega event. They hold a series of 5ks, not just one. Clay and I ran the first 5k of the morning – for men 40 and over. I was hoping to break 21 minutes because last year you had to break 21 minutes to be in the top 250 (of men 40 and over) The top 250 get a special medal. Clay had an awesome race. He started the race with a mask to avoid allergy problems and took it off half way. He finished in 19:42. I did so-so. I ran a steady pace and finished in 21:16. But, as I crossed the finish line there were a couple of young ladies still handing out those top 250 medals! My actual chip timed placed me at 273, but I guess I was one of the first 250 to get from the start line to the medals! Yeah! After our race we wandered through the expo and back to the motel 6. We showered and headed out to watch the other races. Clay brought two scooters. We took them out so we could scooter around to watch the races. We saw some of the second race – Masters Women. The third race was for men and women in their 30s. Caleb Schroeder was there. We cheered him on and he had a good race finishing in just over 19 minutes. The fourth race was men and women under 30. We found a spot on the last stretch and tried to cheer the youngsters into big finishing kicks. There was a walk, next so we snuck away and got some brunch. 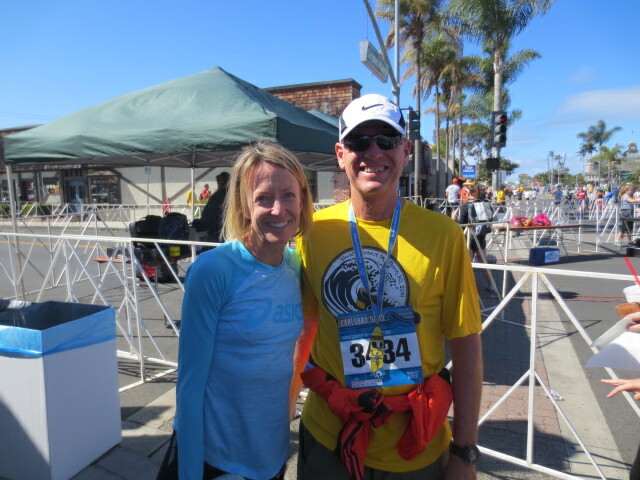 Headed back I spotted a familiar face -Deena Kastor?” Olympic Bronze medalist and American Women’s marathon record holder. She was very friendly, agreeing to the picture and asking how our races had gone. By now wheel chair races were finishing. We watched 4 or 5 go by. Then a train came…. Yes, a train. The Amtrak train tracks cross the racecourse right after it begins and just before the finish line. They time the start of the races to go right after the scheduled trains. One poor wheel chair competitor came around the corner speeding into the downhill finish. A worker with a mega phone got in the middle of the path yelling at him that he had to stop for the train! He braked and coasted easily up to the train. It left as he got there and he was able to finish….. Finally, it was time for the elite races. The most familiar name in the ladies race was Jordan Hassay. We watched them make the first left turn onto the Blvd. Then we headed down to the 2 mile mark of their return leg…. Then we rode the scooters to a spot, the high spot of the course where they begin their surge to the finish…. Julia Beasdale, of Great Britain, as you see was well ahead. She won the ladies race. 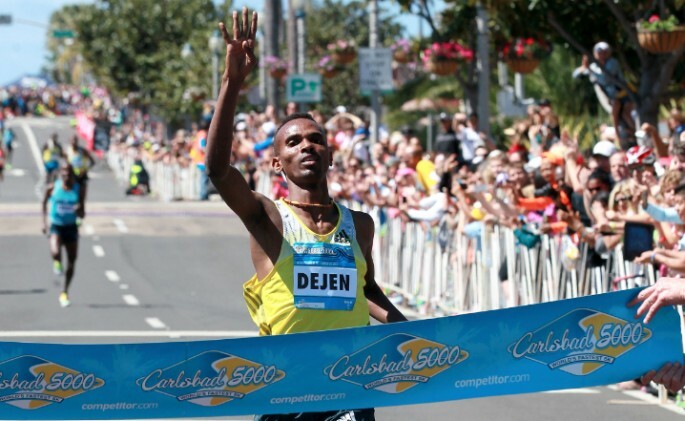 Dejen out raced Bernard to win for the fourth time in 13:13. Bernard came in second setting a new American record in 13:18. On the way home Clay and I discussed that this needs to be an annual event. We can’t wait to go back next year, race fast(er) and rub elbows with the world’s elite! Glad to hear that you had fun. Cool picture with Deena! Do you think you could win the elite race on your scooter? I could keep up with the last guy for maybe half a mile on the scooter. Steve Scott was 10th in the 1500 in 1984 LA Olympics. He never ran a marathon to my knowledge. I was at the Sunkist Invitational in Jan 1977 and watched him run his first of 136 sub 4 min miles. Hmmm, I think I got 3 runners all mixed up….. My main mix up was that I was picturing Frank Shorter. He won the marathon, just a different year. But I was thinking an American won the marathon in Los Angeles… that was correct, too. Only it was Joan Benoit Samuelson…. I did get Steve Scott in the right Olympics…. I need to edit this.